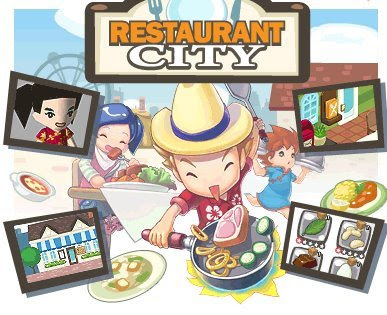 Alot of people is playing this Restaurant City and Pet Society these days. I prefer Pet Society more than Restaurant City but that flash just don't load! Keep stuck at the loading page... That's why I turn to Restaurant City. Beside this, another thing will be scrolling through a loooooooooong list of 'TEMPORARY' friends to get the 1st visit ingredients. It's kinda disappointing cos I got alot of sausages and peperonis... Anyone want some??? And kinda curious, why prawn is so popular? I just don't get it!!! There are hell lot of dishes around, why everyone aiming for prawns? And so many people get prawns from 1st visit or daily quiz and they'll open thread in forum to show off! =="
This game's flash requires alot of RAM memory I guess... I just can't load anythig else while I'm playing the game. I guess my computer is just out of date... Too old. Anyway, try play this game if you got nothing better to do! But be caution, this game is ADDICTIVE! For those who wanna add me for Temporary friend, just type 'RC' in your friend's request in facebook! If you do know me for REAL, type other things such as blog, friend, watever.... I keep all temporary friends in one list and will delete them all one day in the future! MY FACEBOOK! CLICK HERE TO ADD! Prawn is the most right section of the main dish Am I right? (I forgot which category though) Because prawn is a rare ingredient so people wants it.